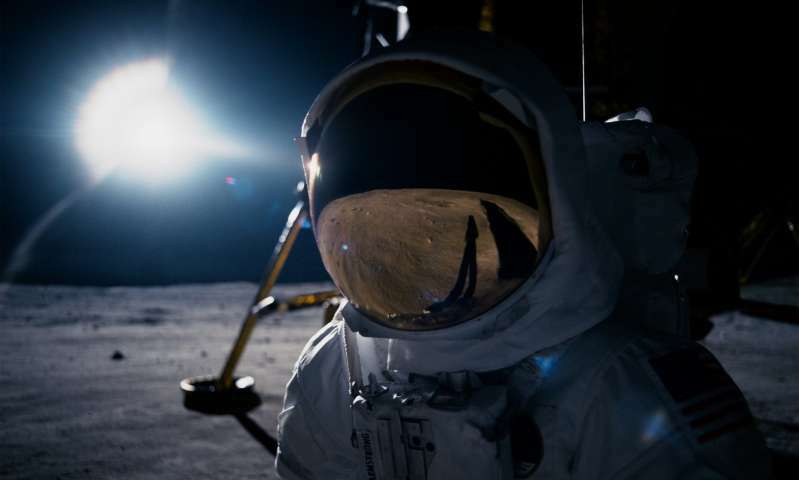 The Apollo 11 lunar landing was the first time humans stepped on another celestial body, and the events leading up to that historic moment – which celebrates its 50th anniversary next year – are depicted in the new movie First Man, out in cinemas today. Director Damien Chazelle has delivered an intense film about astronaut Neil Armstrong, who made those iconic first steps. But this is no triumphant paean to the Cold War Space Race, and you'll find no trite comparisons of Apollo technology to the computing power of today's smart phones here. Drawn from the official biography by James R Hansen, Armstrong is portrayed with muscular introversion by Ryan Gosling, grappling with Armstrong's renowned discomfort with the public demands of the space program, his role of husband and father, the intellectual and physical challenges of the quest for the moon, and a series of deeply personal tragedies. In a quiet opening scene, Armstrong sings a lullaby, I See the Moon, to his infant daughter, echoing the transcendental fascination with the Moon held by generations of sleepless parents and children over the course of our evolution. Space films developed a few recurring themes since then. There's the heroic manly astronaut addicted to risking life and limb. With the notable exception of Hidden Figures, women tend to be shown marooned at home, anguished and accommodating of their physically and emotionally distant husbands. Then there's the passionate flight director, swearing to all who will listen that he'll get the astronauts home safe. 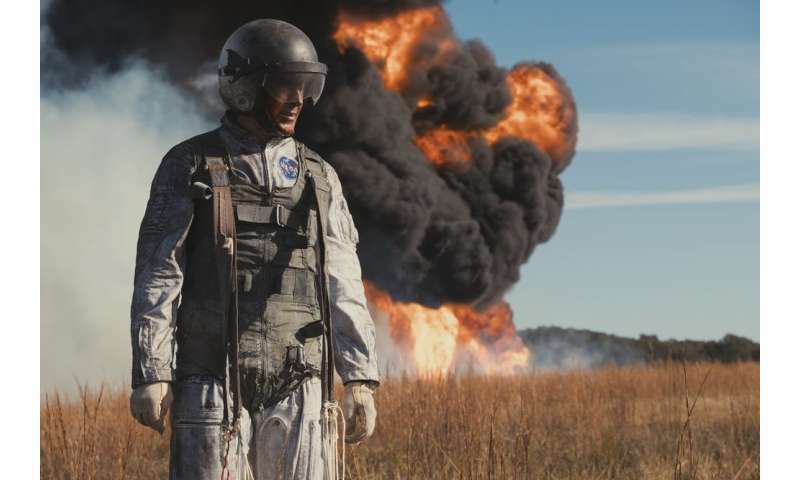 There are a respectful number of references to other movies such as The Right Stuff, Apollo 13, and 2001 A Space Odyssey that embed First Man within the well-established tradition of cinematic space flight. These references highlight this film's differences, drawn from the well-grounded depictions of Armstrong and his wife Janet, played by Claire Foy. The sequences between husband and wife are emotionally charged, rather than sentimentalised. The scenes where she listens to the radio feed from the landing are riveting. It is hard to imagine more Oscar-worthy contenders. Chazelle, the Oscar-winning director of La La Land, said the omission was not political; instead he chose to focus on the "unfamous stuff" as well as Armstrong's experience and character. The flag was controversial even at the peak of the Cold War. The United Nations Outer Space Treaty, ratified by the US just two years before, forbids territorial claims in space. How could an American mission claim to represent humanity if it included a symbolic act of American colonialism? Australian space scientist Professor Brian O'Brien, then at Rice University in Texas, designed a dust-detecting experiment that was left on the surface of the Moon. There is an element of anti-climax about the film's conclusion. As with Apollo 13, we know how it's going to end. Now that we have "conquered" the Moon, perhaps the only mission worthy of Armstrong's legacy is to be humble, thoughtful and inspired about our place in the universe, while we still have one. - Apollo 11 plaque inscription on the Apollo 11 lander. If there was a point during my life when America was truly great, that was it.